Launched in 2006, Daleel Madani is Lebanon's civil society network. Through Daleel Madani, member civil society actors can register and benefit from a variety of services, such as posting resources, projects, call for proposals, events, press releases, and job vacancies. Daleel Madani currently has a directory of more than 1,300 civil society actors ranging from collectives to national civil society organisations, international NGOs to UN agencies and donor organisations. It is the most regularly updated and used site by civil society organisations in the country, and gathers over a million pageviews per month. Daleel Madani aims to enhance the availability of and accessibility to information about civil society, in addition to strengthening civil society cooperation and enhancing the sector in Lebanon. Launched in 2006, Daleel Madani (civil guide) is an online portal for civil society actors in Lebanon. Through Daleel Madani, member civil society actors can register and benefit from a variety of services, such as posting resources, projects, call for proposals, events, press releases, and job vacancies. Daleel Madani currently has a directory of more than 1,300 civil society actors ranging from collectives to national civil society organisations, international NGOs to UN agencies and donor organisations. It is the most regularly updated and used site by civil society organisations in the country, and gathers over a million pageviews per month. 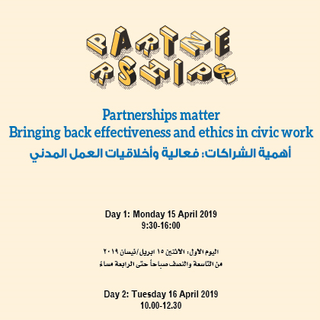 Daleel Madani aims to enhance the availability of and accessibility to information about civil society, in addition to strengthening civil society cooperation and enhancing the sector in Lebanon.